John has had the privilege of showing at some of the most prestigious shows across the continent; and is proud of each horse's accomplishments. 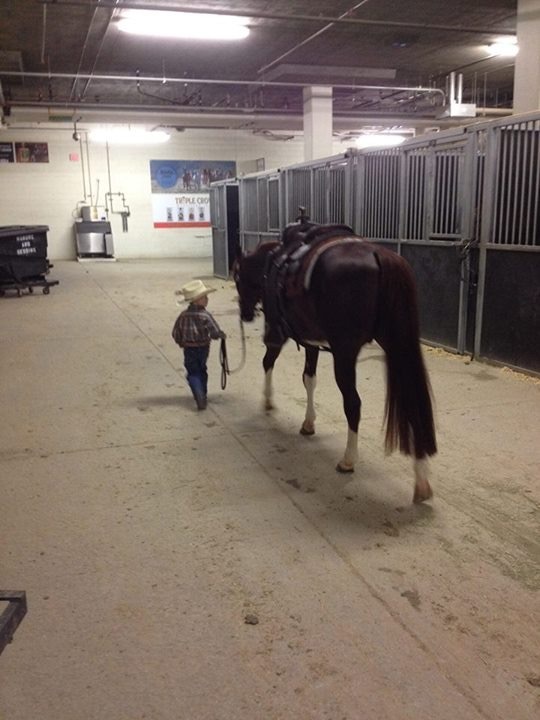 Of greater importance are the amazing people we get to meet and teach in this very exciting equine sport. 2012 Three-time Open SBF Champion on Crazy Cat Lady (owned by Ron Stuckert & Diana Runge), Open SBF Champion at Alberta DFI, Canadian Supreme & Canadian DFI shows! With 4 superb derby horses in fine form, the trailer was loaded and John & Mel headed to Las Vegas, Nevada. Our family was super excited as this show coincided with spring break at school, so we decided to join John in Vegas and cheer him on! As usual the competition at these prestigious NRCHA events is tough and trainers and non-professionals travel from across the continent for the competition. There were many great runs and the Open finals were determined from the top 20 aggregate scores for herd work, reining and fence work for all 138 entries. We were thrilled to have 2 horses in the finals, and a 3rd only missing finals by one point! 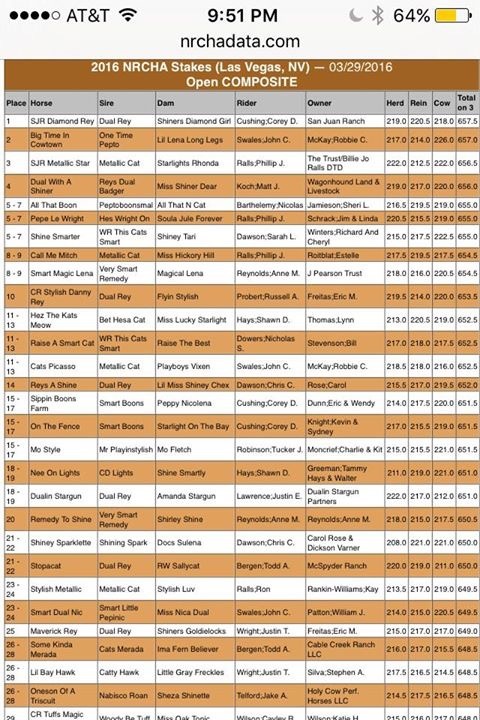 Congrats to Bill & Carrie Patton and their horse Smart Dual Nic for a 23rd/24th place finish in the Open Derby Preliminaries. Prior to the Open Derby Finals, non-professional, Mark Parsons, and his fancy gelding, Colorful Illusion, made an impressive run taking home the title of Non-Pro Hackamore Champions!!! Congrats Mark! So glad you made the journey to Las Vegas. As usual, the finals were determined by the fence work in the preliminaries and Robbie McKay’s gelding, Big Time In Cowtown, showed his talents and speed with an impressive 226 down the fence!! As the announcer said, he was “Big Time In Las Vegas” that day! Harley, as we know him, was also strong in the other two events cumulating a preliminary aggregate of 657 to sit second in the preliminaries! CLICK HERE TO WATCH THE 226 RUN ON YOUTUBE. The other finalist was Cats Picasso, also owned by Robbie McKay. 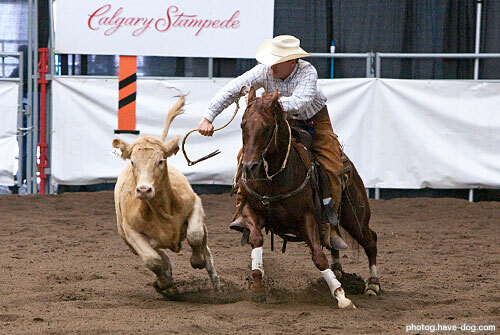 Cats Picasso, known to us as Tonto was very consistent landing a solid spot in the Open derby finals. This Metallic Cat stallion was also in the running for an exciting incentive offered by the owners of Metallic Cat… $10,000 to the horse sired by Metallic Cat with the highest aggregate in the Open Derby Finals. There was a lot of hype during the show regarding this incentive; and there were some extremely talented derby horses in the running, including the well know horse Call Me Mitch, ridden by Philip Ralls. Needless to say the finals fence work came quickly and the crowd was buzzing! We were honored to have extended family drive from California to come cheer on John in the finals; thanks to Anne & John Thiessen for making the miles and sharing in the moment with us! 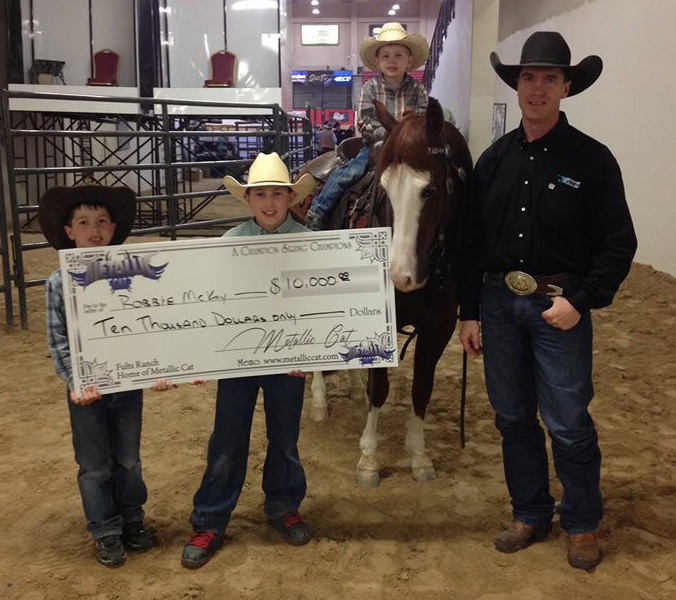 Call Me Mitch was the first Metallic Cat to show and they had a great aggregate; Tonto needed a 221.5 to surpass They Call Me Mitch… well the run was fast and Tonto was in perfect position on a tough cow… the score… a 221.5!! Wow! Then, to add to the excitement the it was announced that Tonto’s score would be adjusted to a 221, luckily it was still enough to top Call Me Mitch by a mere half a point! But there was still one Metallic Cat to show… the waiting game is hard, but as the afternoon unfolded and the numbers were tallied, Cats Picasso remained on top of the Metallic Cat incentive competition! Congrats to Robbie McKay on the exciting incentive win as well as placing 10-12th in the Open Derby Finals on Big Time In Cowtown and 5th on Cats Picasso! Of course, we have to give thanks to the Creator of these fine athletes… they are truly amazing animals! This year John was positioned rather differently during the week of the Aaron Ranch Derby and NRCHA World show; his bottom was glued to a chair instead of a saddle as he watched the show via the live-feed! It was a difficult, yet easy decision not to travel to the World Show with the outbreak of Vesicular Stomatitis (VS) in Texas combined with the particularly poor Canadian-U.S. exchange rate! When discussing the decision with clients, it was clear that it was important not to jeopardize travel to the NRCHA Stallion Stakes in Las Vegas in March by possible quarantine from returning home to Canada. So John and most of the horses stayed in Canada. One of our clients, Keri Hudson-Reykdal, did decide to travel to Texas as she knew she couldn’t swing Las Vegas; and we were ALL so glad she did!! Fellow Canadians Bart & Terri Holowath were also heading south, so Won Smart Wolf & Don Quejana boarded their trailer and Keri boarded a plane from her home in Manitoba. February 18th, 2016 was a day to remember!! This was the day that Keri Hudson-Reykdal & Don Quejana captured the Intermediate Non Pro NRCHA World Championship!!! Keri was over the moon and so were her many fans!! I know I shed a few tears of joy celebrating this tremendous success and watching how proud John was of both Keri and “Shorty”! What a way to finish off the show season! Congratulations Keri – you earned it! Congrats also to Terri Holowath on her Non Pro Two Rein Championship at the World Show! It's been an outstanding year! We want to sincerely thank ALL of our clients for their business and the opportunity to show and train such incredible horses! Good luck to everyone showing at the 2015 Celebration of Champions in February 2016 in Fort Worth, Texas! Entry deadline is January 14, 2016 (due in-office); www.nrcha.com for more details. Merry Christmas and Happy 2016!